This premium keyboard package centers around the Yamaha P-45 digital piano, a slim, lightweight piano with satisfying action and great sounds. It also includes a stand and a bench that add up to an extraordinary value. If you are considering a P-45, consider this package. 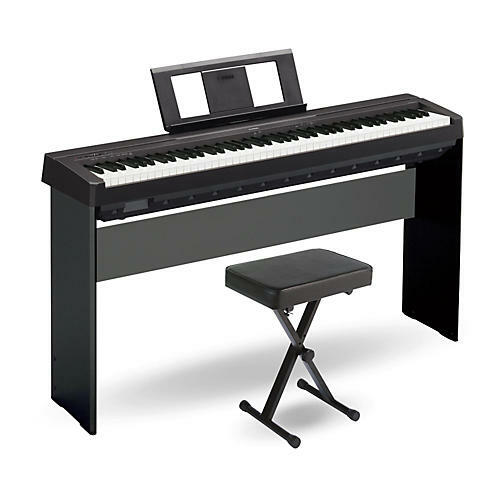 The P-45 is the lowest-cost, 88-note, weighted action digital piano that Yamaha offers. This digital piano is ideal for the needs of the beginner piano student. It features 88 blocked-end weighted keys, built-in speakers and best of all, Yamaha's legendary piano sound. It features a complement of other common keyboard timbres as well, including electric pianos, harpsichord and strings. The Yamaha PKBB1's ultra-thick padding, extra-wide single seat, and adjustable height ensure the utmost comfort. The bench folds up for your traveling convenience. 17-1/2" to 19-1/2" height. Black finish.